Montevideo, the capital of Uruguay is an often overlooked South American city with a European flair. Uruguay is a liberal nation with a sordid history and progressive laws. Nestled between Brazil and Argentina, it’s a coastal nation with its own personality. 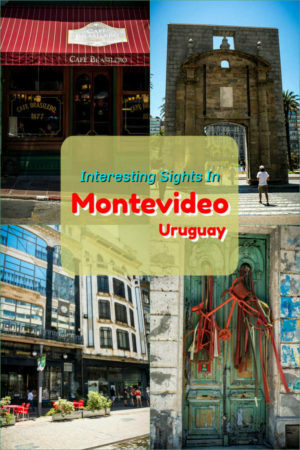 We found plenty of interesting things to do in Montevideo and other parts of Uruguay. If you only have time to visit one area of the city, Ciudad Vieja (old city Montevideo) is it. Charming and historic, its pedestrian-only walkways will take you back to the 1800s. It is a mix of modern life with colonial Europe. The gentle, easy walk from the port to the historic district takes about 20 minutes over relatively flat and paved footpaths. Standing tall at 95 metres (312 feet), Palacio Salvo was the tallest building in South America when it was built in 1927. Today, Sky Costenera in Santiago Chile holds the record. 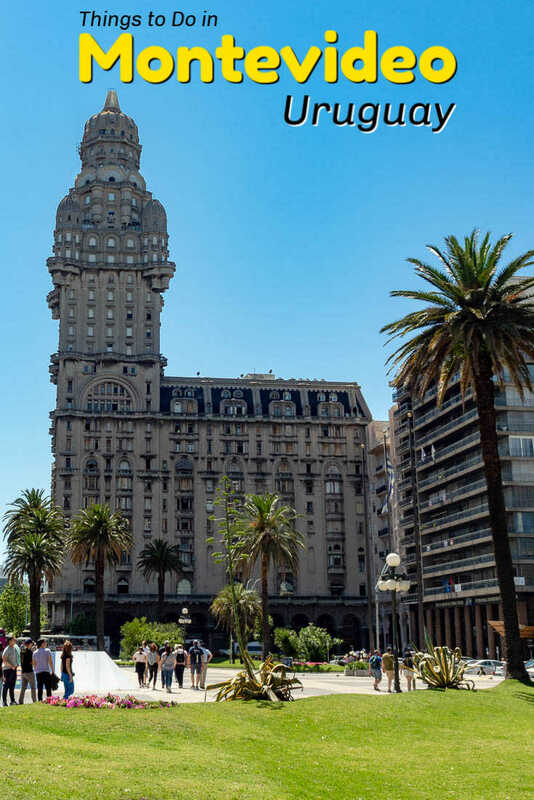 Palacio Salvo is home to the Tango Museum as well as a lookout on top of the tower (one of the free things to do in Montevideo). Palacio Salvo in Plaza Independencia was the tallest building in South America until 1935. The first church of Montevideo is now the seat of the archdiocese. It is the city’s main Catholic cathedral. Inside are the remains of several important people including the tomb of Uruguay’s first president. However, unlike other South American countries, Uruguay has no official religion and less than half of the population identifies as Catholic. 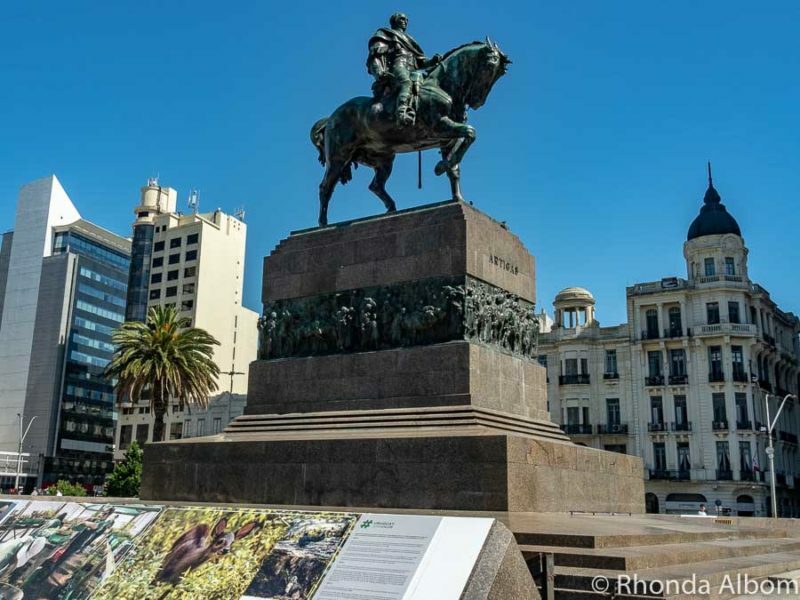 You will know you have arrived at Plaza Independencia when you see the prominent statue of General Jose Gervasio Artigas. He was the initial leader in the movement towards Uruguayan independence, the “father of modern Uruguayan nationalism”. Below the statue is his mausoleum. Open to the public, entry is via the staircases on either side of the statue, and can easily be missed. In the tomb, you will find the remains (ashes) of this national hero protected by federal guards. The old city gate originally led into a walled Montevideo. The gate is not in the original position and is now aligned with the main street. The only original part of the gate is the square of white stone above the opening. The current presidential palace is located on Plaza Independencia. Nearby is the former presidential palace (the short, white building with columns in the photo just above) that is now the Government House Museum (Museo de la Casa de Gobierno). 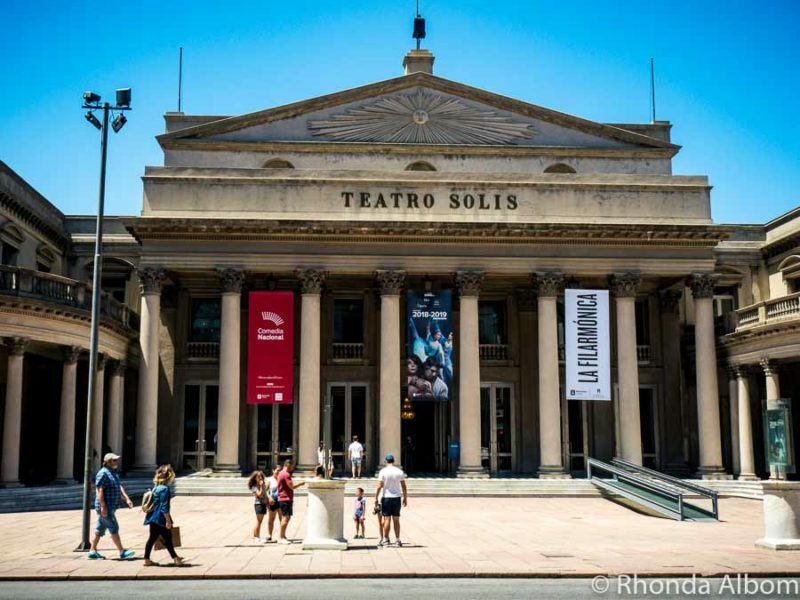 Boasting an elegant and renovated interior with outstanding acoustics, the Solis Theatre is the oldest theatre in use in South America, having opened in 1856. It is also the second largest on the continent. We saw an impressive carnival presentation here that also featured Candombe music and dance. Candombe is an Uruguayan style brought to South America with the African slaves. Solis Theatre sits at the edge of the Montevideo Old Town, separating it from the modern section. Gaucho Museum (Museo del Gaucho) – Gauchos are Uruguayan cowboys. Tango Museum – Argentina and Uruguay both lay claim to inventing the tango. 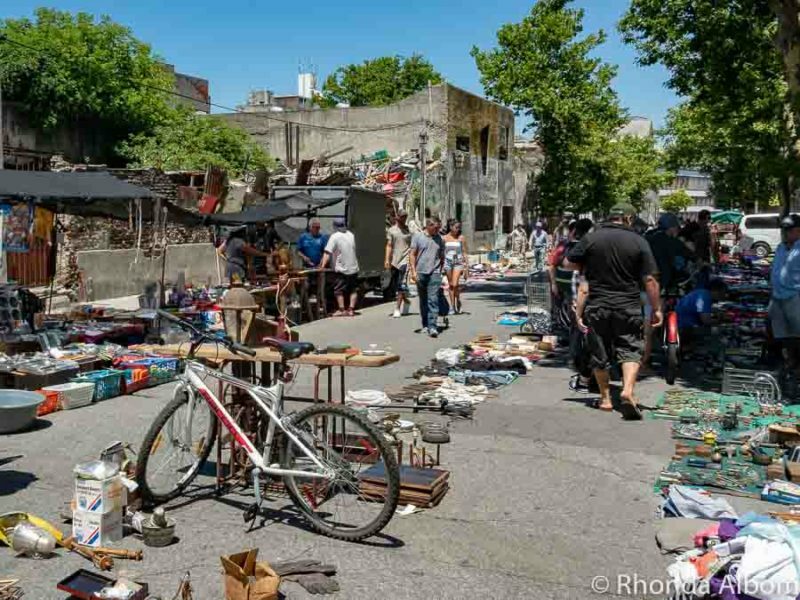 If you are in the capital of Uruguay on a Sunday, the flea markets are one of the best things to do in Montevideo. 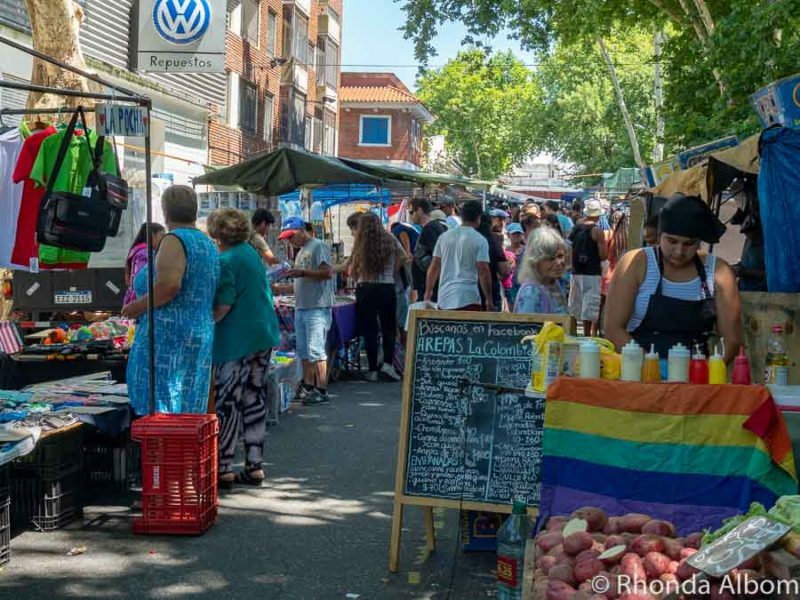 The market officially runs along Avenue Tristán Narvaja, then unofficially for block after block off to the sides. Although, the farther you wander from the official market, the more you need to think about safety (see below). We were advised not to head north beyond the market. Regardless of where you are in the flea market, stay vigilant about pickpockets. A portion of the official section of the Montevideo flea market. Side roads off of the flea market have merchandise on the ground, and the neighbourhood has changed a bit too. A place for shopping and food, the port market is the ideal stop for anyone arriving via cruise ship that has extra time either before or after an excursion. Be aware that it caters to tourists, and prices tend to be higher than in other parts of town. 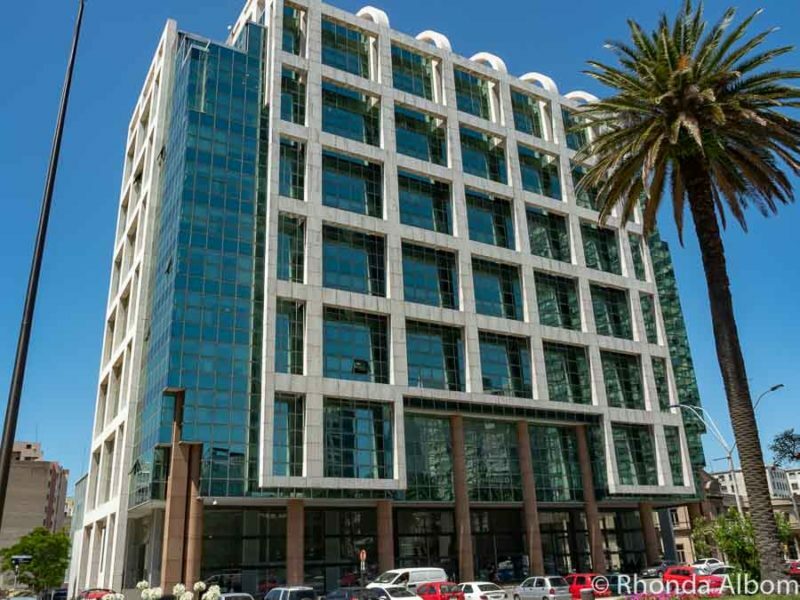 However, it is conveniently located right across the street from the port, and often has street performers on the weekends and when cruise ships are in town. It is the type of place one could spend an hour or half a day. It’s also the place to go for a famous Uruguay steak. Called parilla in Uruguay, it is similar to the asado in Argentina. This restaurant inside the Mercado del Puerto. Notice the traditional way meat is served, both the plate in the foreground and the barbeque in the centre. There is duty-free shopping at the port, just inside the gate in the little building that looks more like a cafe than a shop. Here we found knives, gifts, food, and other tourist items at better prices than at the port market. An old ship graveyard near the Port of Montevideo. 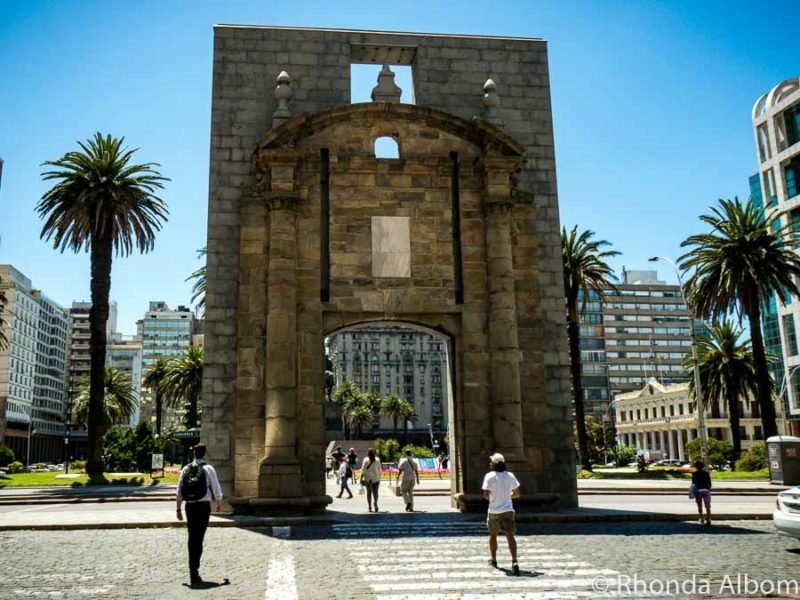 We took a free Montevideo city tour, a historical overview of the old town. Although there is no fee for the tour, the guides work for tips, so the cost should be similar to any other tour. Walk along the 10-mile coastal stretch called La Rambla. One of the things you will see is a Holocaust memorial. Enjoy one of the beautiful, clean Montevideo beaches. Overlook the city from the fort on the hill (Fortaleza Del Cerro). There are three laws on the book that clearly distinguish Uruguay from other countries in South America, and are credited to former sandal-wearing President Jose Mujica. First-trimester abortion is legal, but only for Uruguayan citizens and under a set of government guidelines. The cultivation, sale, and consumption of Marijuana is legal with limitations and government control; however, only for Uruguayan citizens. Marriage equality is on the books. A pedestrian street near the port market. Notice the marijuana leaf sign on the right-hand side of the street. A notice inside the door tells us they cannot sell to tourists. One thing you can’t help noticing, unlike other South American countries we visited, is the high percentage of white European Uruguayans (88%). This is a direct result to the country wiping out its indigenous Charrúa population in 1831. It’s a shameful past that current citizens seem embarrassed by. 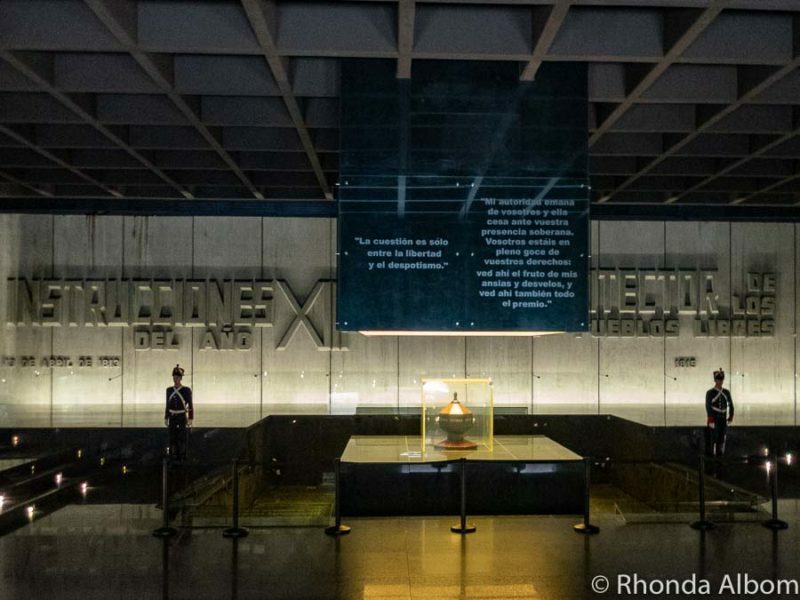 You can read about it here: Charrúa – Genocide. 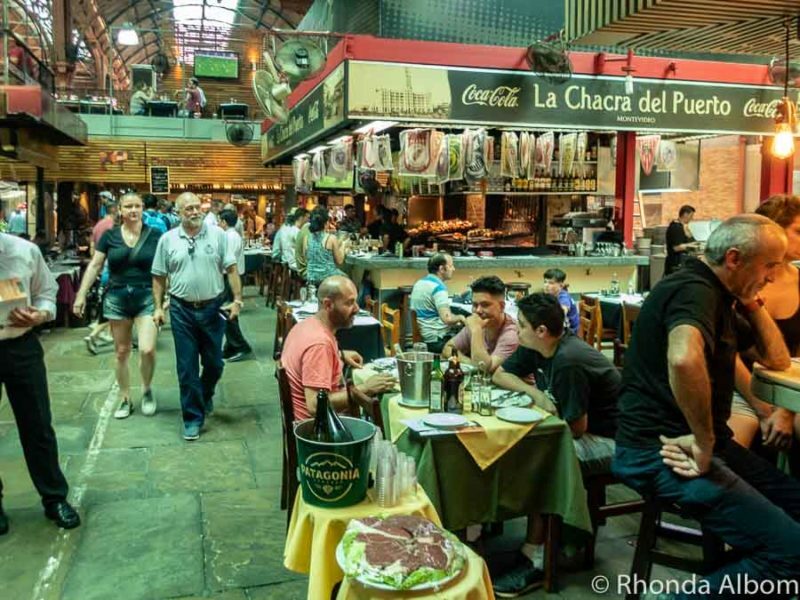 If you’re going to spend any time in Uruguay, even just a day, there are a few things you will want to try. Share a mate with friends. It’s a tea-like beverage drunk from an open top cup through a metal straw called a “bombilla.” You will see Uruguayans walking down the street, mate cup in one hand and the hot water thermos wedged firmly under their arm. Sample Grappamiel, often referred to as the national drink. It is a sweet wine with honey. Sip some medio y medio, a combination of equal portions of wine and champagne. If you’re like me, you are going to be looking for the best coffee in town. You will find it at Cafe Brasilero, the oldest cafe in Montevideo. If you want a real treat, try their Cafe Aliano made with coffee, milk, amaretto, and dulce de leche. 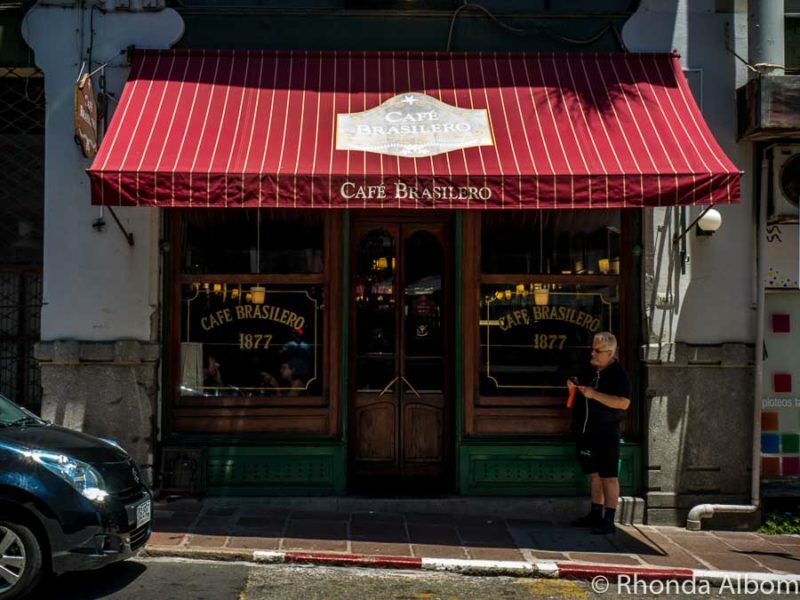 Cafe Brasilero is both the oldest cafe in Montevideo and home to the best coffee in the city. 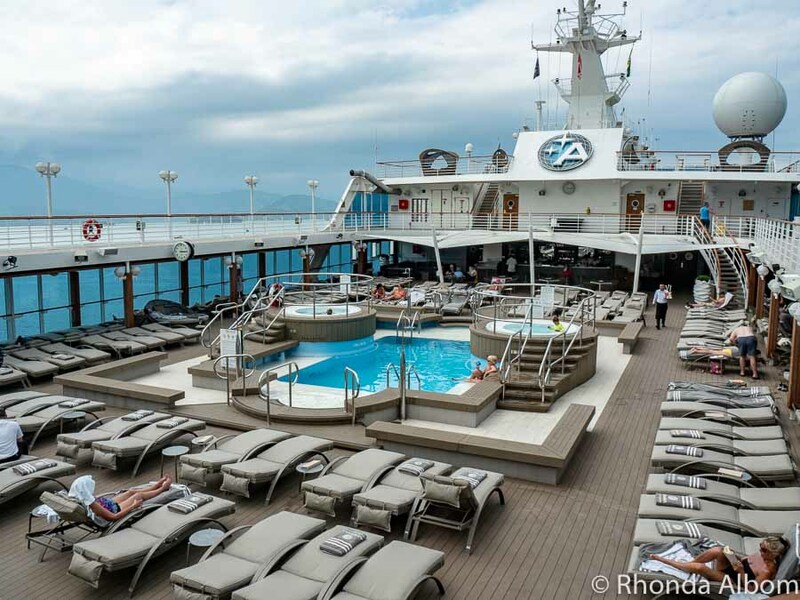 We were in port for two days and spent the night on our ship. However, Montevideo hotels cover the full gambit from five-star luxury to backpackers. We hit the big three of Uruguay, each as independent visits, although one could easily do day trips from Montevideo. Punta del Este (a resort town frequently visited by Argentineans). Colonia de Sacramento (One of Uruguay’s oldest towns and an easy day trip from Montevideo or from Buenos Aires). Buquebus offers ferry service from Buenos Aires to Montevideo. We took Buquebus from Colonia de Sacramento to Buenos Aires and found them to be clean and comfortable. They are the only company offering a direct Buenos Aires to Montevideo ferry. If I were to do this, I would want to spend the night in Montevideo, as the ferry, plus customs takes several hours each way. A better option from Buenos Aires might be a tour. 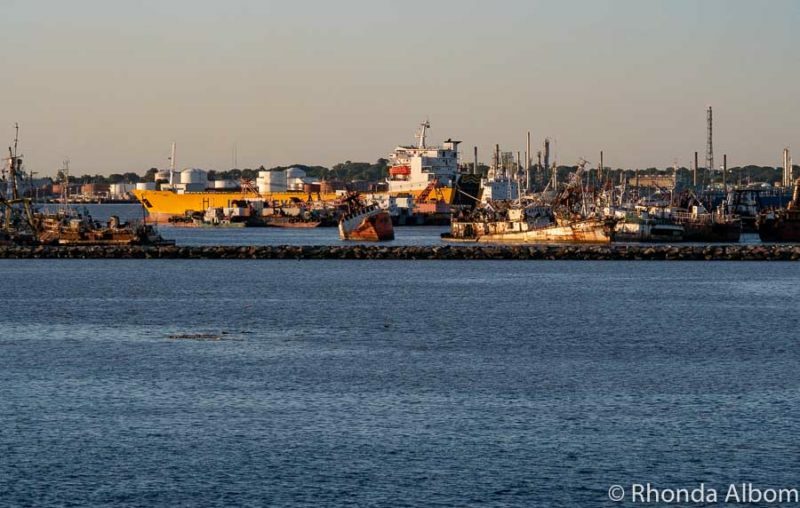 We took a ferry from Buenos Aires to Colonia de Sacramento with Colonia Express, and waiting at the dock were Buquebus busses headed to Montevideo or to Punta del Este. This is a lower cost alternative than taking the ferry directly to the capital city. We have rented several cars in South America, and have had all positive experiences going through RentalCars.com. As an aggregator, they offer cars from local car rental companies, often with additional coverage over what the locals would have provided, and English speaking customer service. Any problems we have had were resolved quickly and easily. We comfortably recommend them anywhere in the world. This is what we did. Arriving on a Sunday and staying until Monday evening, we had plenty of time to explore this charming Uruguay coastal city. Renting a bicycle is a great way to get around once you are in Montevideo. Uruguay is considered to be one of the safest countries in South America. However, one still needs to be careful. 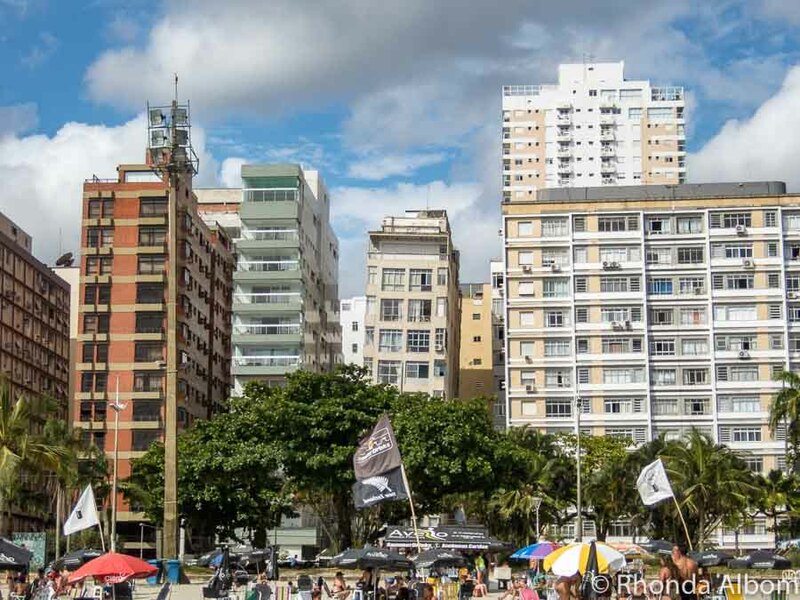 Our best safety tips for South America can be found on our page about Rio de Janeiro. 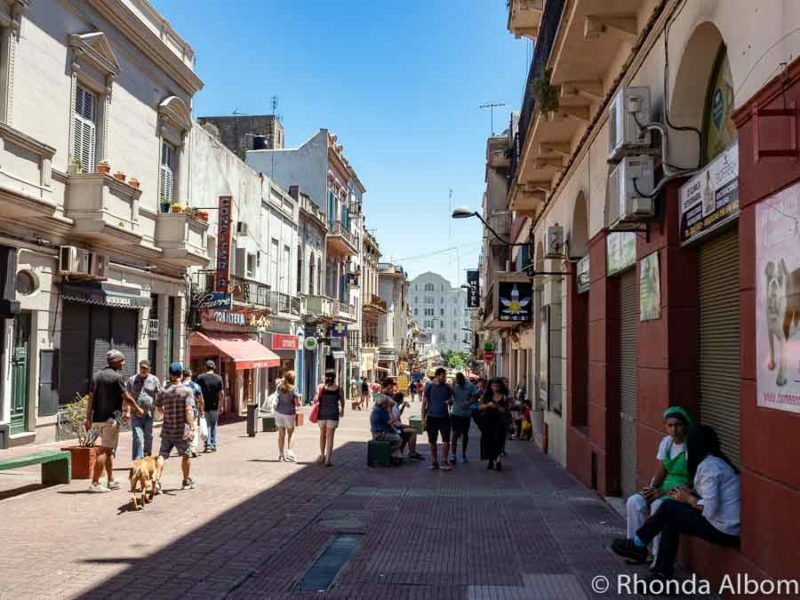 According to a port consultant on our ship, the safer areas of Montevideo are the port market area, the historic district, and La Rambla. He also advised not to travel north to portions of the city including Parque Batlle, Aguada, Tres Cruces, and Buceo without a guide. If you go to the flea market, be cautious about pickpockets. A 10% tip in restaurants is customary. While it is legal for Uruguayan citizens to smoke marijuana, it is NOT legal for tourists. Weather is unpredictable, especially in the summer, so bring a rain jacket. If you buy gifts that you are taking out of the country, you can get a VAT tax (22%) refund near the port terminal. Look for the small blue building, or check it out under “Other Benefits” point number 2 on the official government site. The population of Uruguay is about 3.5 million people and 12 million cows. Which of the things to do in Montevideo will you do first? Wonderful shots of this amazing part of the world! Glad I enjoyed the post! congrats for all your travels, your work, and pictures !!!! Montevideo looks like an interesting city. I have read about Buenos Aires being a “European” city and wonder how does Montevideo compare to that? Lots to do in what looks like a very cool city. My daughters college roommate has family here and always reports back from visits about how wonderful of an area it is. I’ve not been to South America but I’d love to visit Montevideo. 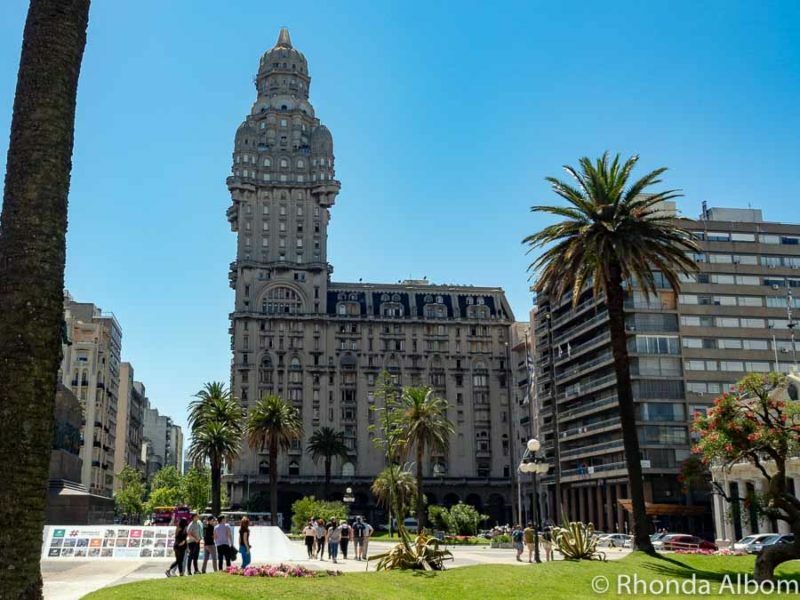 Montevideo looks full of history! I would love to wander through the Sunday market. I think flea markets are a great way to dive into the local culture. However, good tips for avoiding pickpockets and staying in the most safe areas. Lovely tour of Montevideo. What an interesting city. I travelled a lot in South America but didn’t make it to Uruguay which is a shame, it looks like an interesting city to visit. The Palacio Salvo is impressive considering when it was built! I had no idea about the genocide here though, it’s not something you get to hear about usually! I love learning more about lesser known places. 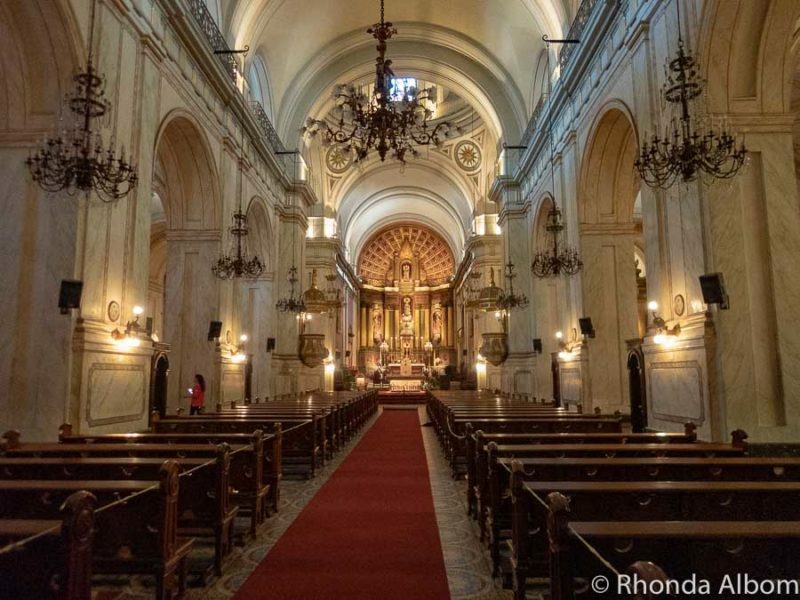 Thank you for sharing this beautiful place – would love to explore South America someday! With all the cool buildings and streets I think your tips were the most intriguing. I guess it’s always best not to look like a tourist or maybe just dress like a cow? I know waiters here that will slash your tires if you only leave a 10% tip. Sounds like Uruguay is somewhat progressive… Following your amazing South American adventures has been so fascinating. I’m sure I would have taken 10,000 photos already! It looks like there is a lot to do there! I like the market. I’m not a person that goes to church every Sunday, or into politics, but I really like their buildings! I don’t know what I expected of the capital of Uruguay, but it definitely wasn’t this. 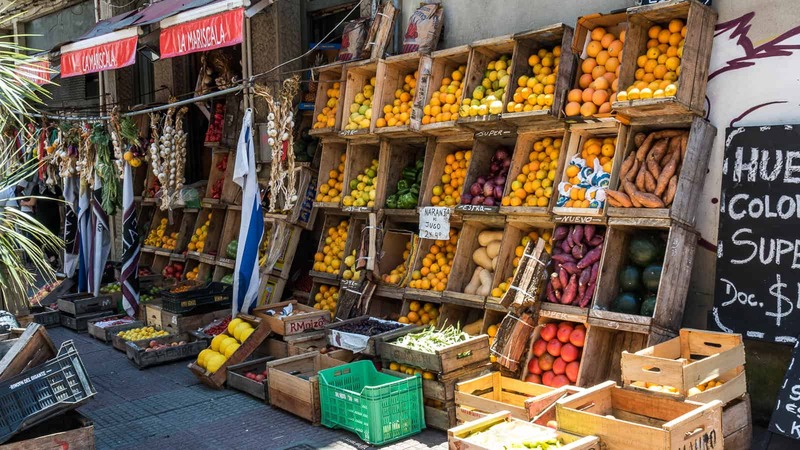 Montevideo looks like an amazing city to visit with all those different influences – from the European architecture to the local street culture and food markets. You’ve definitely made me look at Uruguay with different eyes through this post. This looks absolutely fascinating, Rhonda. Thanks for guiding me through Montevideo’s must-sees and giving me all the historical background. Love that picture of the bicycle too! Uruguay I haven’t been in that part of the sphere yet but the Montevideo Old Town looks stunning for a stroll photography, it reminds me the glorious days of the places while walking around and listening to the history. I get to travel to far away places through this blog. Thanks. The market looks great! Yum! Hello, wonderful trip and photos. A beautiful place to tour. Happy Monday, have a great day and new week ahead! Uruguay is not really on my radar of places to visit at the moment, but I enjoyed your post very much. It is good to get inpiration for the future. Great post with a lot of useful information. I really want to visit Uruguay and especially Montevideo. I love all of that beautiful colonial architecture. The markets looks fun and going to the tango museum looks like a neat outing. Uruguay is a country I don’t often read about — in fact, I couldn’t think where it is when I started reading your post. So Montevideo looks interesting. 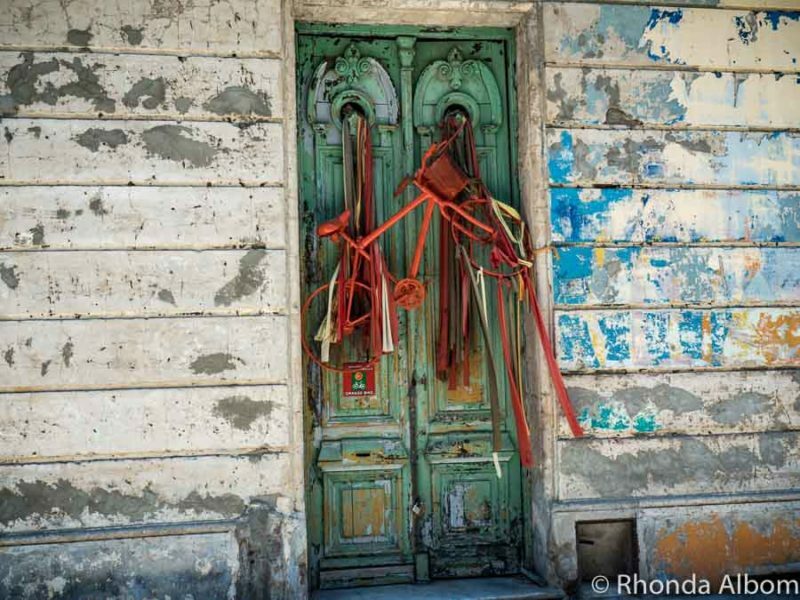 Your photo of the door decorated by the bicyce is simply stunning. We head to South America in 2020 so are starting to look at things to see and do. I do love pedestrian centres so Montevideo might be a place for me. I love the look of Salvo Palace. Always interesting to see city gates left standing. I hope we are there on Sunday to go to the flea market. Although a visit to the beach may be a fun thing to do if we don’t do a city tour. Good to know we can get there from Buenos Aires by ferry. Thank you for the wonderful memories back to Montevideo. This was one of my favorite cities for the relaxed pace and food including the parilla. I walked by the City Gate several times and didn’t realize how only the little opening was the original. Thanks for that 🙂 Too bad you didn’t make it to the Gaucho museum. It was one of our favorites and a great place to learn about mate and this unique drink that is so much part of the local culture. Great article and such an amazing city. I never thought about going to Montevideo Uruguay. The place appears to be very interesting. By the way, what ship were you on to take this interesting cruise? I’ve never been to Uruguay, but after reading this I can’t wait to visit. The museums and port market appeal to me the most. A few years ago we took a Buquebus Ferry from Buenos Aires to Colonia del Sacramento. After a few nights in Colonia we drove a hire car to Montevideo. The road between the two cities is a modern highway and we had no trouble doing the drive in a few hours. It meant we had a car when we arrived in Montevideo too which allowed us to see more than we would have been able to on foot. I’ve never been to South America and haven’t really researched anywhere there. Montevideo definitely has a European feel from the architecture. I’d be all about checking out the markets and doing foodie things! I feel like mate has become trending all of a sudden. I’ve been hearing a lot about mate recently and you recommend it as a local drink to try. It would be amazing to see all of this architecture! And visiting the market would be quite the experience! This is such a beautiful place! I will definitely like to visit sometime. Adding to my travel bucket list as well…So many places so little time….. Such a beautiful country! There seems to be so many things to do there…definitely worth adding to the travel bucket list! It looks like a delightful area to explore. I’d be all over those markets. Very beautiful place. I just add this place to my bucketlist. The cathedral has to one of the most beautiful I have ever seen. Whoa this place looks fun Rhonda. I have no idea why Uruguay isn’t covered more, or, why the place is not a common travel spot. My friend visited the glam beach down there and adored it. True paradise. Thanks for this marvellous trip around Montevideo, which I felt I should be doing with a mate in my hand! My father was Uruguayan but grew up in Argentina, so I always side-stepped this fabulous city for Buenos Aires instead. I must do a stopover next time. Montevideo looks beautiful and there are so many interesting things to see. Sorry you didn’t get a chance to visit any of the museums. The Tango Museum would’ve been first on my list. Glad you spent time at the markets where I’m sure you enjoyed seeing the people as much as the wares. Thanks for another wonderful tour, Rhonda. I wonder what happened to the wall in Montevideo, will have to google that. The City Gate is cool. I’d want to see that. Then definitely a trip to the market.